This confetti is from our seconds stock, but it's still gorgeous as you can see from the picture. 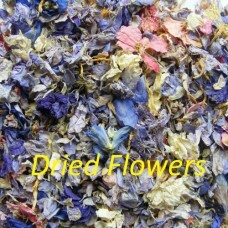 Mix it up is a great confetti mix, fun and traditional, made up of lots of different colours of delphinium & wildflower petals and even sometimes the odd rose or hydrangea petals added in. This confetti is from our seconds stock, but it's still gorgeous as you can see from the picture.&nb..